The Seaway mechanical building takes shape. 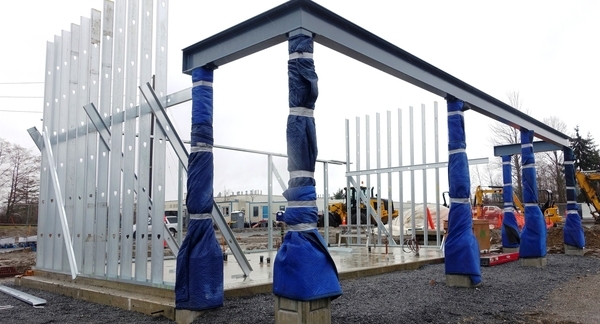 The columns of a covered entry area are wrapped with blue tarpaulin for protection, while steel beams await walls and a roof. Masonry will cover the metal studs. The building that will house mechanical functions of the Seaway Transit Center is now being framed. The steel beams will support an overhang and the metal studs will provide the backbone for masonry walls and a metal roof that will be installed over the coming months. Concrete footings for bus shelter sites around the transit center have been poured and are ready for the shelter structures; installation of the structures should begin in April. Foundations for the final three traffic light poles are now complete, and the poles themselves will be in place next week. The traffic lights will be operational in 2-3 months. Construction crews took two days this week to add sub-base gravel in what will eventually be two bus pullouts along Seaway Blvd. In late spring, the gravel will be covered with concrete to form the bus pullouts, gutters, curbs and sidewalks for transit center users. See a short video of the gravel being compacted at bit.ly/2FIxWho. Community Transit Live will air twice this month, with one-hour webcasts providing real-time information about Swift Green Line construction and the agency’s newly released service and fare change proposals for Fall 2018 and Spring 2019. Thursday, March 15, 6-7 p.m.
Wednesday, March 28, 12-1 p.m. If you aren’t able to attend the live webcast, visit www.communitytransit.org/ctlive ahead of time to submit your questions in advance of the webcast. A subtitled recording of each Community Transit Live is posted online within two business days. On the west side of I-5, a recently completed foundation for future traffic signage may have to wait a little longer. The foundation — which will eventually support a pole, mast and signage designating the new bus-only lane — was hit by a vehicle last weekend. The Washington State Department of Transportation (WSDOT) will inspect the foundation to determine the extent of the damage. Swift Network News will publish the results of the inspection and information about any delays the accident may have caused as soon as the information is available. Work on the east side of I-5 has slowed pending the completion of work being done in a joint utility trench between 3rd Ave. and the on-ramp to northbound I-5. Several utility companies have work to do in this trench, and it is hard to predict how long it will take to complete. Community Transit will begin grading for new curbs, sidewalks and driveways in this area as soon as the green light is given. Work to Begin on Stations at Elgin Way/Dumas Rd. Just before press time, Swift Network News learned that construction crews are set to break ground on 128th St. SE at the Elgin Way/Dumas Rd. intersection, at the site of future Swift Green Line stations on both the eastbound and westbound sides of the street. It is unclear exactly when construction will begin or whether the work will be done during the day or at night. Next week’s Swift Network News will have complete information. 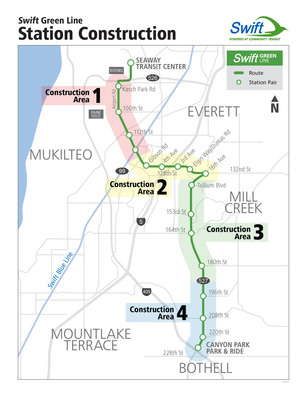 Meanwhile, construction on other Swift Green Line stations has been slowed somewhat while waiting for the Washington State Department of Transportation (WSDOT) to review and approve materials and traffic control plans. When the approvals are received, crews will immediately break ground on the last station of Area 2 and move quickly into Area 3 (see map below) to work their way south along the corridor of the Swift Green Line.